Video: We only recently learned that the spectacular Spider-Gwen would be joining Peter Parker, Miles Morales and a whole bunch of other Spider-heroes on Disney XD's Ultimate Spider-Man animated series. But now we actually have a glimpse of her in action, and it looks like she's bringing some family drama with her. 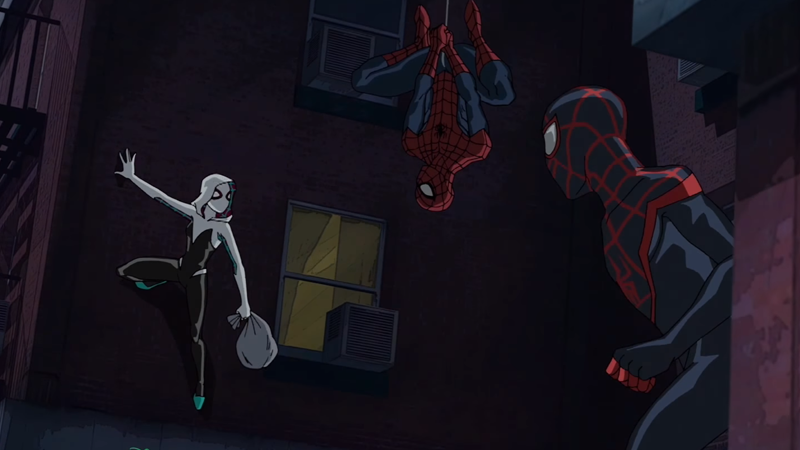 The clip, from the show's upcoming season finale "Return to the Spider-Verse", shows Spider-Men Peter and Miles chasing after Gwen (voiced by The Descendants' Dove Cameron), thinking she's robbed a bank. Instead, she's actually preventing a robbery, but can't really get her point across before her police captain father shows up to arrest them all. Captain Stacy probably needs to go back to the drawing board if he thinks giant robots are an effective form of policing spider-folks. "Return to the Spider-Verse" continues on Disney XD in the US on September 17.